The wave of 90s nostalgia shows now signs of slowing down, and if you feel like you're in need of more anthropomorphic animals in your life, you're in luck! It's been almost a decade since we last saw everyone's fourth favorite talking mouse in Stuart Little 3: Call of the Wild. After his ten year absence, Sony and Red Wagon Entertainment finally feel the time is right for a Stuart Little remake. News of the reboot comes from Tracking Board. 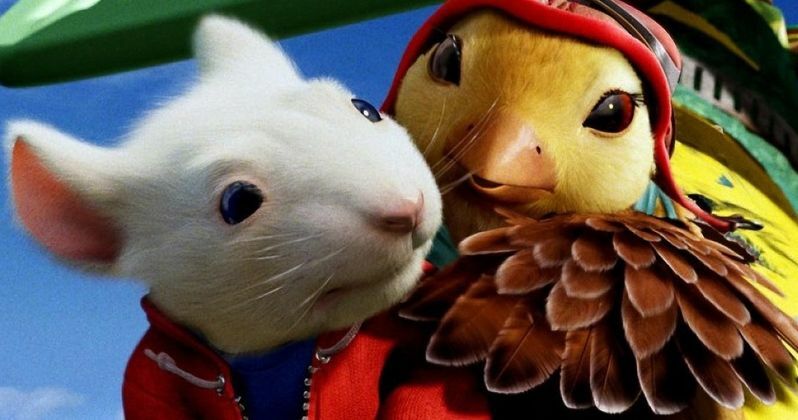 They claim that this new Stuart Little will follow in the footsteps of the 1999 original. It will blend CG animation with live action. It will also once again follow the biplane flying mouse and his adoptive family The Littles. The new movie will more closely follow E.B. White's 1945 children's book of the same name. It is being looked at as a more accurate adaptation than merely a remake of the existing films, or a reboot of the entire franchise. The report goes onto claim that Stuart Little will carry the same tone as a John Hughes movie. This is a popular refrain nowadays, as we've heard the same thing about the 2017 Spider-Man remake. Though, it should be noted that John Hughes isn't only known for his slick teen movies that helped establish a PG-13 rated dialogue for high schoolers. The legendary writer and director also created the family features Curly Sue, Home Alone, Beethoven and Baby's Day Out later in his career. The Stuart Little book was an instant classic upon it's release exactly 70 years ago. The 1999 movie earned $300 million at the box office, and was a huge blockbuster success. Michael J. Fox voiced the title character, with Geena Davis and Hugh Laurie playing the parents. The then very popular Jonathan Lipnicki played their son and Stuart's best friend. A sequel titled Stuart Little 2 was released three years later in 2002. While it still made an impressive $169 million, it wasn't as big of a hit as the first movie. Stuart Little 3: Call of the Wild was released direct to video and is notable for being fully animated. No talent has been added to the movie, though its possible that Michael J. Fox could return to voice Stuart, even though he skipped out on the very last sequel. There is no proposed release date yet, but audiences most likely won't see the movie until 2018 or 2019. Douglas Wick, who produced the original, will also serve the same duties here. It isn't known if a script has been written yet. Red Wagon is finishing up it's Divergent series with the final two films, The Divergent Series: Allegiant: Part 1, which hits theaters in 2016 and The Divergent Series: Allegiant: Part 2, which arrives in 2017. They are also in the pre-production stages on a remake of The Craft which follows a group of high school witches. No casting has been announced for that movie just yet, but we can expected to hear more soon.